The Hillstrom Museum of Art at Gustavus Adolphus College presents Animal and Sporting Paintings in the Penkhus Collection: The Very English Ambience of It All, will be open during regular hours during Fall Break, October 22-25, and continue through November 6, 2016. Museum hours are 1:00 – 5:00 p.m. Saturday/Sunday and 9:00 a.m. – 4:00 p.m. weekdays. Admission to the exhibition is free and open to the public. The exhibition includes sixty-one works fine artworks from the remarkable and impressive collection of Dr. Stephen and Mrs. Martha Penkhus that provide detailed glimpses into the English countryside, its occupants, and their activities, from around 1800 to the present. 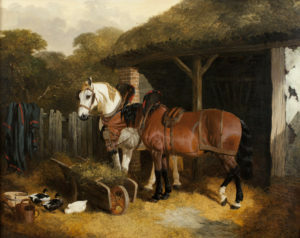 Thirty-six different artists, mostly British, are represented, among them key sporting and animal artists such as John Frederick Herring, Sr. (1795-1865) and Harry Hall (1814-1882), and Royal Academicians James Ward (1769-1859) and Sir Alfred Munnings (1878-1959), the latter who served as President of the Royal Academy. Works in the exhibit feature images of racing, pets, hunting, and prized livestock including cattle and, especially, horses. Both these animals are depicted in the sole work included by a French artist, the famed Rosa Bonheur (1822-1899), acknowledged as one of the greatest animal painters in the history of Western art. There are four sections in the exhibit, Livestock, Racing (subdivided into Flat Racing and Jump Racing or Steeplechasing), Pets, and Foxhunting. Foxhunting was for centuries a common aspect of English country life, one that at least initially was considered crucial in order to protect smaller livestock on which foxes preyed. Because the fox has a limited number of natural predators, hunting them was part of the normal agricultural calendar. Presently foxhunting is not practiced in England and it was outlawed by the Hunting Act of 2005. There are works in the Penkhus Collection that have the “following of the hounds” as their subject matter. They were chosen because they reflect a love of the countryside unspoiled by industry, a simpler time, the beauty of the horse, the correctness and skill of the riders, and the handsome hounds. Animal and Sporting Paintings in the Penkhus Collection: The Very English Ambience of It All is accompanied by a fully-illustrated catalogue that includes texts by F. Turner Reuter, Jr., an acclaimed historian, connoisseur, and collector of sporting and animal art who has published extensively on the subject, is owner of Red Fox Fine Art in Middleburg, Virginia, and serves as a member of the board of trustees of the National Sporting Library & Museum (also in Middleburg). As with all programs of the Hillstrom Museum of Art, Animal and Sporting Paintings in the Penkhus Collection: The Very English Ambience of It All and its receptions are free and open to the public. Collector Steve Penkhus will make some comments about the Penkhus collection at the opening reception on September 12, at approximately 7:30 p.m.
Additional information about the Museum and its programs can be found at www.gustavus.edu/hillstrom.